Today’s blog is all about rethinking spaces. Do you have a space that is being used for one thing, but might be better suited as something else? That is what happened to us. We had an office that was off of our kitchen. It was 5 feet by 10 feet in size. It was too small to be used as a home office, and our kitchen was lacking storage space (especially with my obsession for dishes). Therefore, I came up with the idea to change it into a French Country Butler’s Pantry, and my dear sweet husband helped me turn this idea into a reality. This is how the room looked before as an office. First, we had to cut the center cabinet out and raise it to kitchen counter height and place a piece of granite on it. This created a coffee bar and place for a beverage refrigerator. Placing the coffee bar in the Butler’s Pantry helps to free up much needed counter space in the kitchen. Also, having an extra refrigerator for beverages is great. Second, we painted the cabinets black. My husband has a commercial spray painting machine which really made the job easier. After the cabinets were fully dried, we sanded areas to give them an aged look. This is an up close view of the cabinets. You can see where we distressed the paint. I tried to do my best, but it is hard to capture the full pantry because the room is narrow and long. This is the entry into the butler’s pantry. This area is where we created a place for the toaster along with an under the counter mount for holding wine glasses which makes good use of the space. Thanks for stopping by today. Tomorrow, I will share the brunch/breakfast recipes that I promised last week. I hope that you have a great Monday!!! I so love that you transformed that office into a butler’s pantry!…..Also love that you painted the cabinets black…such a dramatic look….I have been seeing more and more kitchens in show homes that have black cabinetry or at least one bank of cabinets or and island in black….great job! Thanks you so much Shirley! I think turning that office into a butler’s pantry was one of the best things we have done with our house. It really comes in handy and helps maximize space. Absolutely wonderful!! Great idea and beautifully done! Wish I could do that….alas….no extra space…. Nancy, thank you for the very sweet comments. This is beautiful! Thanks for sharing at Home Sweet Home. Thank you for the kind comment Sherry. I hope that you have a great week!!! Hi Shannon. It’s so nice to meet you. 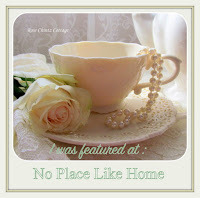 You left a comment on my blog, bringing french country home, and I wanted to check out your blog. I love that you were able to re-make your office into a pantry and the chicken (rooster?) lamp is adorable. I also want that French board on the wall! Pat, thanks for stopping by to read my blog. I’m so happy that you like my butler’s pantry. It was a really good use of space in our home, especially since I have a bad addiction for dishes-lol. The French board was purchased at Paul Michael’s. They have an online store, but I’m not sure if they still carry it. Have a great rest of your week and a Happy Fourth of July!!! Shannon I will feature this today at Home Sweet Home! Thank you so much Sherry!!! You have made my day! I am new to blogging and deeply appreciate you letting me join in on the party! This is fabulous, what a great space! Thank you so much Carole. I’m so happy that you stopped by. I hope that you have a wonderful weekend a Happy Fourth of July!!! Great makeover. Very pretty and functional! Thank you Sherry! I’m really enjoying the space. It has turned out to be a great extension of the kitchen! I hope that you have a great week!!! I LOVE this transformation. It looks like it was supposed to be a butler’s pantry all along. Your dishes look great with the dark contrast behind them. Thank you for linking up! Thank you Eilis! Transforming this space was a lifesaver. I have so many dishes and was in need of storage space. I have a bad dish addiction! I think this may be my most favorite spot in the house. I popped over from Thoughts of Home on Thursday and have been enjoying all your room tours! Such a lovely home! This butler’s pantry is genius and a dream of mine! Hi Deanna! Thank you so much for your kind comments. I’m so happy that you stopped by and that you are enjoying my room tours. You saying that has made my day! I hope that you have a blessed day and a wonderful weekend!!! Wow Shannon, can you imagine how happy I was to have stumbled onto your website-“an hour late and a dollar short”, as they say. You and your husband did such a splendid job on your pantry! I have been looking for the right black for a sideboard that I am painting, would you be willing to share the paint color that you used, it seems to be the perfect black? Have you discovered how difficult it is to find the perfect yellow, good grief! Hi Denise! I’m so happy that you found my blog! Thank you so much for your sweet comment! The paint color I used is called Safety Black by Benjamin Moore Ultra Spec. I know what you mean about finding the right color of yellow. Yellows can be so hard to pick out. In my other house, I had yellow walls, and I miss them so! Try looking at a sample of Blonde by Sherwin Williams. It will all depend on the undertone you are looking for and the lighting in your house. Again, I’m so happy that you stopped by! I’m new to blogging and have been at it for about 4 months. I hope that you are having a wonderful weekend! Happy Fall!!! I,too, am a dish-a-holic. Why waste money at Starbucks when you can start a new pattern at TJ Maxx or Marshalls. I see you love In The Kitchen With David, QVC, Temp-tations dishes. I think their blue Floral Lace patterns look a lot like Flow Blue antiques. I found you 2 weeks ago, and was instantly obsessed with your calico blue pumpkins. Too late to find them at Walmart this year, but will look next year or at the after sales this week. Ous thrift stores just put out tons of Xmas, and I have been obsessed this week.